Allied to waving was the manufacturing of mats, baskets and rope using read, flax papyrus, palm fiber and grass. Mats were woven on horizontal looms, while baskets were made by coiling a fibrous core spirally into the shape required. Baskets were as common as pottery in the Egyptian home and were used as containers for food; clothing and household linen Nevertheless, a great deal of pottery was made and used by the ancient Egyptians, although it was not a ancient Egyptian crafts at which they excelled. 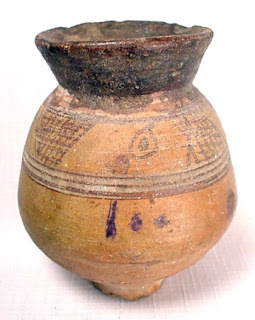 The best pottery belongs to the late predynastic age, when fine black and red wares were produced, as well as vessels body painted in red on buff. It was not until the Eighteenth Dynasty that painted was reappeared, the most striking examples being blue-painted buff vessels especially common during the reigns of Amenophis III and Akhenaten. Let us return once again to the craftsmen who created some of these works of art in ancient Egypt and take a look at the organization of one particular group about which we have a lot of information: the tomb-builders of Deir el-Medina. These artisans were dived into two groups, the left and the right gangs, which presumably worked on the left- and right*hand sides of the tomb at the same time. The gangs were controlled by two foremen who were appointed by the vizier, although the posts became hereditary. The son of the foreman often became his father's deputy before taking over full responsibility for he gang. Working with the foreman was an official scribe who administered the activities of the workmen and the village. He oversaw the distribution of tools and materials from the royal stores, carefully registering what was given to each man. He also kept lists of those who were not at work and the reason for their absence and most importantly, her received and distributed the men's wages, below the scribe was a guardian who looked after the official stores, while other guardians acted as watch men over the tomb under construction. These would be supplemented as necessary by the official police of western Thebes, the Medjay. The main body of the workforce consisted of stonemasons, plasterers, sculptors, draughtsmen, painters and carpenters. They worked for eight days out if ten living in huts above the Valley of the Kings and returning to the village for their two days of rest. During the day they were supposed to work for eight hours with a mid-day meal break but absenteeism was frequent. Days were lost for such reasons as brewing beer, building houses and drinking, a and these, added to the large number of religious holidays, show that the tomb-builders in fact only worked for about six months of the year. Their payment was in Kind: wheat and barley for making bread and beer, water, fish, vegetables, cosmetic oils, wood for fuel, pottery and clothing. On festival days they were given more elaborate food, including wine, as well as bonuses of oil, salt and meat. In order to help prepare these foodstuffs a number of female slaves were assigned to the village. At times the delivery of these essentials became irregular or ceased altogether. On several occasions the men actually wet on strike to demand that their wages be sent. Nevertheless, these 'servants of the place of truth', as they were at one time called, were comparatively well of. They used their skills to construct highly decorated tombs for each other. There were also opportunities for moon-lighting-making tombs or funerary equipment for the well-to-do Thebes. Their houses were well appointed and their lists of possessions, as we have already see, could be relatively impressive Of the living standers of other craftsmen and ancient Egyptian crafts we unfortunately know little, but it is to be suspected that by and large they were less comfortable.